Mohali, April 9 (CRICKETNMORE) Having scored just 150, Sunrisers Hyderabad made Kings XI Punjab stretch till the second last ball of the 20th over before K.L. Rahul picked a double off Mohammad Nabi to win KXIP their third game at the I.S. Bindra Stadium this season. 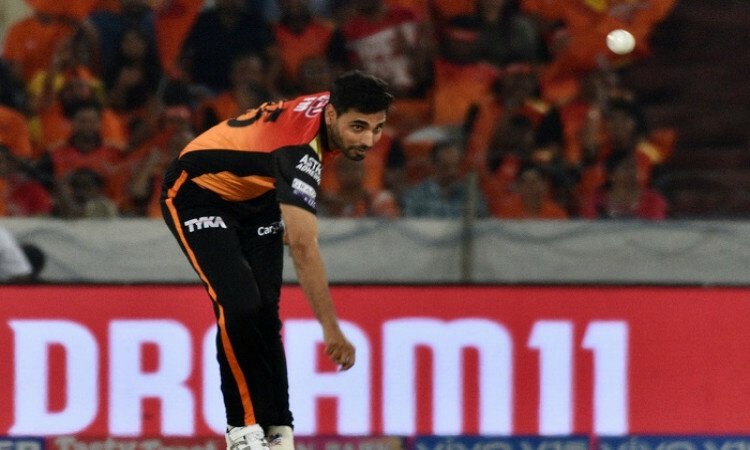 But SRH skipper Bhuvneshwar Kumar said while a loss is always hard on the team, he was proud with the boys' effort despite dew playing a strong part in the second innings on Monday. "Of course it is hard but I am pretty happy with the way we bowled with the dew around. It is a bit difficult with yorkers and slower balls, but given the dew, we executed our plans pretty well. The yorker is something you can't bowl and the bowling plans depend on the length of the boundaries," he said. "When we came to bowl we kept the dew factor out of our minds and all we wanted to do was stretch it to the last over." SRH now have a five-day break before they take on Delhi Capitals at home on April 14 and the captain feels that it is a good thing as the boys will get to assess how the tournament has gone so far and how they should come back strongly for the rest of the season. "It is a good thing to get a break now, we can assess what we have done so far," he said.